In all that I experience, I shift my awareness to the positive. Can you believe it's already May?! I had a busy weekend and this new month is welcoming me with a pretty full calendar already. Am I alone in feeling anxious if my weekends have plans for both days? Still, they are all good things and I need to work on turning anxiety into excitement. 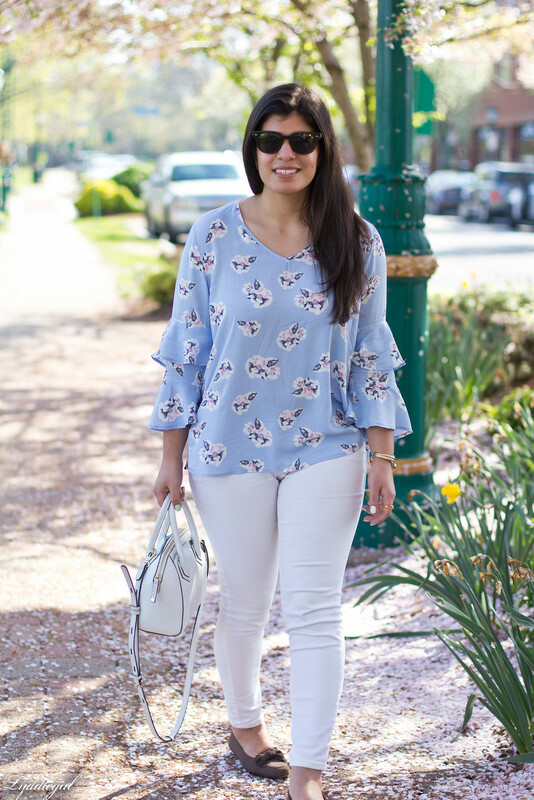 Today I'm collaborating with Bella Ella Boutique and several other bloggers styling this fun floral blouse from their shop. My take on the blouse is for a day of shopping, so I made sure I chose a pair of flat shoes that are easy to slip on and off. What is worse on a shopping day than shoes which are a pain to take on and off - plus flats are important if I'm going on a marathon shopping trip. 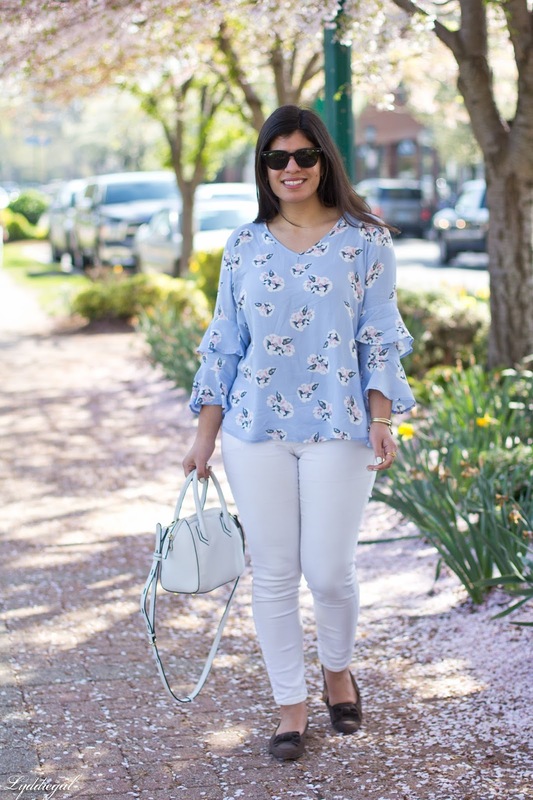 As the blouse is light and flowy, I kept the rest of the look bright and included a bag that allows for hands free shopping. For your reference, I'm wearing the blouse in a size large, and while the size chart stated I could go for the medium, I'm happy I have the large. There isn't any stretch to the fabric and it's meant to flow, not cling. I was so happy I got this blouse in time to snap some photos before my pink trees dropped all their petals - I love that they coordinate with the blouse! This post is sponsored by Bella Ella Boutique. Thanks for supporting the brands who support Chic on the Cheap! 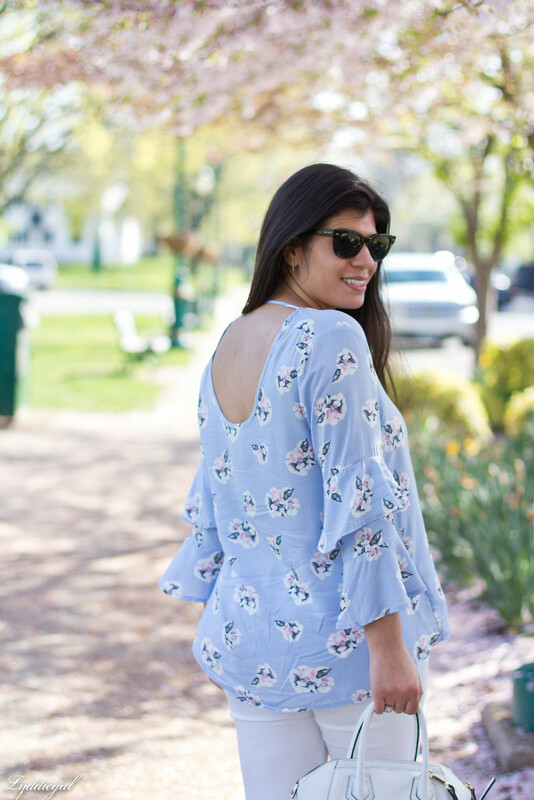 There is nothing more fun in the spring than being able to coordinate with the blossoms - such a blogger cliche, but honestly, it's the best thing as far as I'm concerned. And this blouse is just perfect for that! As for anxiety about weekends with plans on both days, sadly I know exactly where you're coming from. When I was working, which I will be back to doing soon enough, I really needed one full weekend day in my pyjamas with Netflix on to decompress...! Here's hoping that when I am back to work, things won't be so stressful and that won't be the case. That shirt is perfect now and such a lovely fit as well! Seriously, how is it May already?! Yikes! Such a pretty color for Spring! And I love those loafers! I'm the same way, when I have too much scheduled on weekends I feel a bit overwhelmed, haha. But at least it's all good stuff for you! That is the best top for spring. 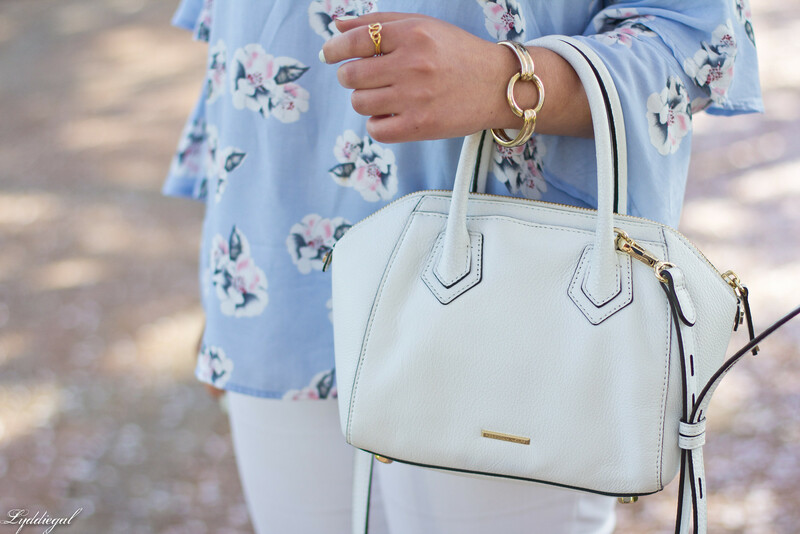 The light colors and floral print make a good combo! This top is so amazing! You look beautiful! This would be a perfect outfit a day of spring shopping (I love the sleeve details on it - very pretty). I love the colors in that blouse! So perfect with your white jeans. The sleeves are really fun. How beautiful! 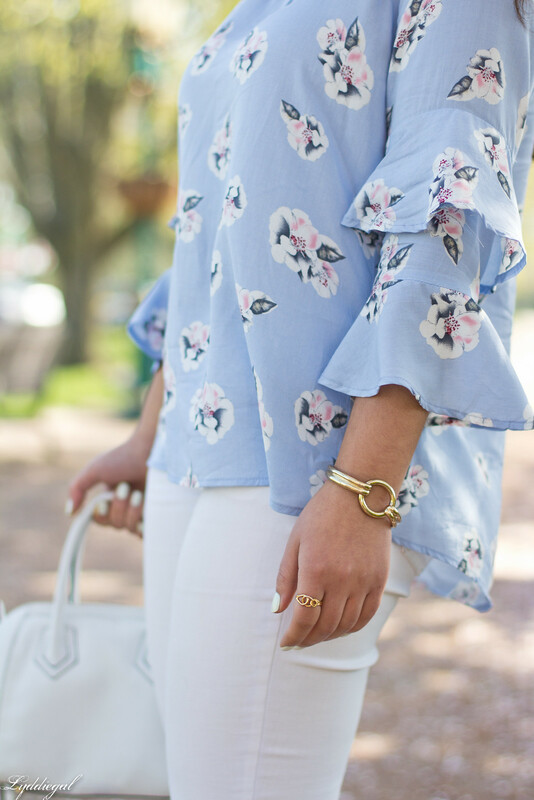 I love the soft colors in this outfit! That top is just gorgeous and I like the flowy fit of it. 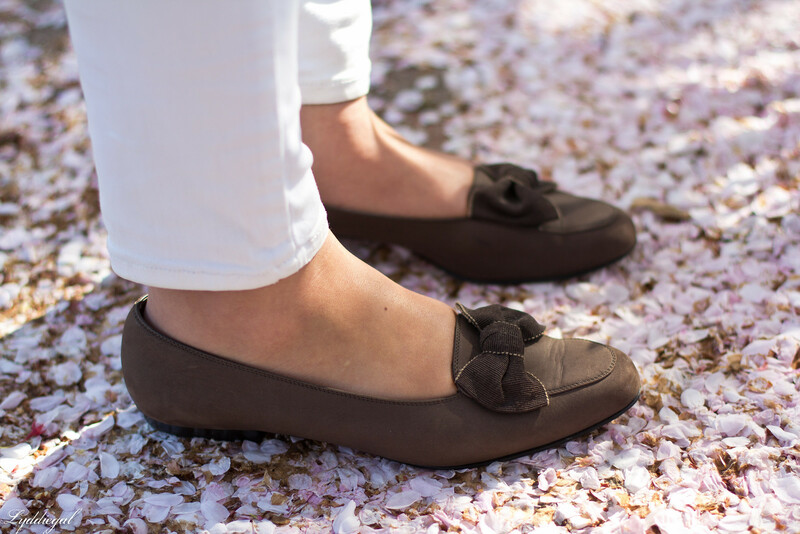 How perfect for spring! Wow, Lydia---the print and the sleeves make this top a show stopper!! And what a great price point too! 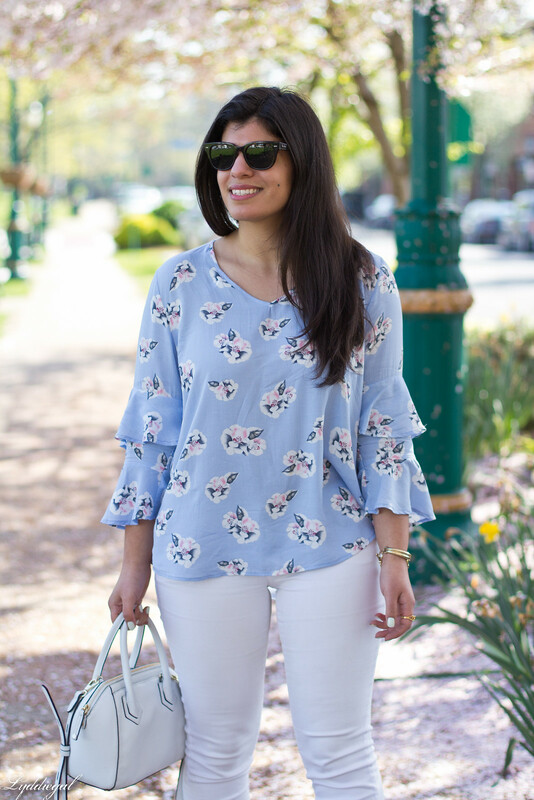 Fantastic top on you and the double bell sleeves are so adorable. Hard to believe that May is already here for real. You look fantastic in that top. I love how you styled it with white jeans to make the top look even more feminine. I love the entire outfit!! Such a lovely style! 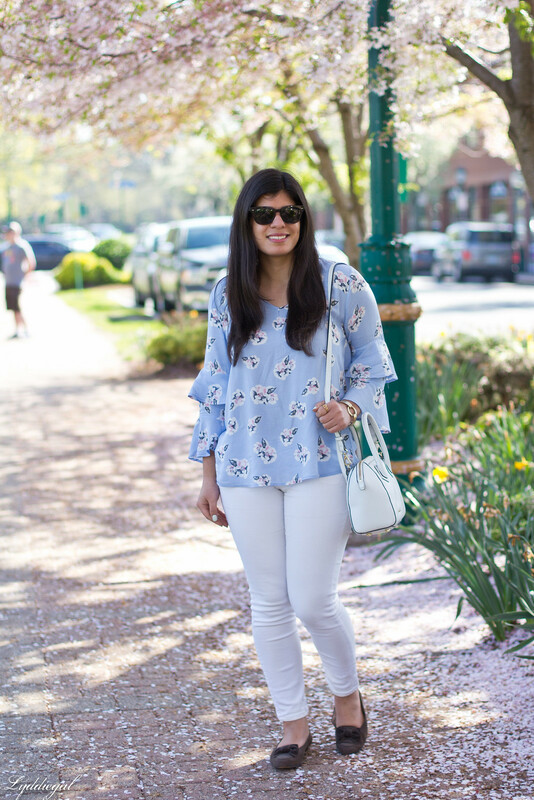 You look so Springy, love this pretty blouse on you. I like the top and can imagine it worn tucked in with white shorts ! Very pretty and so perfect for spring! I love the flowers.